While no one would argue its effectiveness, it’s becoming a word without meaning, a word that lacks a real identity. What is content marketing? We know that it’s an integrated approach to content creation, SEO, social media marketing, and influencer and customer engagement, but this is where the story ends, and far too often, it takes your brand—and its story—with it. Content marketing is a discipline about storytelling; only in an odd turn of events, it often leads us away from the desire to tell it. We get caught up in engagement metrics, follower numbers and branding. We create content and often lose touch with the big picture, of why we’re creating it in the first place. It becomes a task rather than an extension of ourselves, of our company. It’s time to change the message. You know who tells great stories? Coca-Cola. Coca-Cola uses a blended approach to delivering stories about themselves, their friends, and their customers. You can find them on nearly every social media channel, and although most businesses lack the resources to maintain this type of presence, their mixed media approach and cross-channel branding efforts are noticed, loved, and effective. So, how do you become more like Coca-Cola? 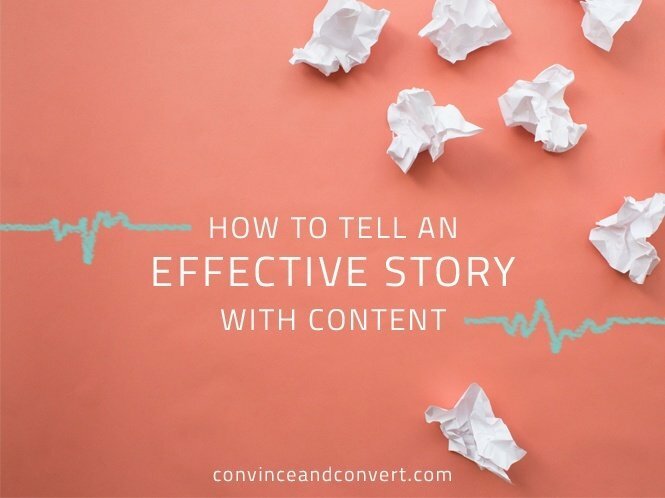 What good content marketers—and storytellers—do well starts with an overriding theme. What message is your story trying to purvey, and what are you hoping sticks with your audience after they view it? Are you a hot tech startup that wants to show off the skill of your employees and how you’re going to disrupt the marketplace with your hot new app or technology? Check out the GoPro YouTube page. It’s awe-inspiring and makes you really want to produce your own content using their technology. This is a company that started with their own story: a need to capture the cool things a group of adrenaline junkies did, which ultimately culminated in a desire to bring that technology to others like them, and at an affordable price point. Are you the mom and pop family farm that creates organic produce and sells it in an online co-op? Burroughs Family Farms is. Front and center right on the homepage of their website is a story that details their beginnings, their ideology, and where they want to go from here. It’s a great example of storytelling in its simplest form. The point is, you have to first identify who you are, and then work outward to determine what kind of story you can effectively tell. The key is in making the story compelling, believable, and human. Originality doesn’t hurt, either. But first you have to identify who you are, and what message you’re trying to deliver. Next, you need to identify competitors in the marketplace. This oft-overlooked step allows you to cater to the law of averages by finding impactful data that allows you to improve upon their big content wins, and avoid content plays that weren’t effective. In short, it saves you time, money, and even the potential for embarrassment. Your story should be original. How you choose to market it doesn’t have to be. The idea isn’t to mirror their strategy. Ideally, you’d take bits and pieces of the most effective content strategies of your competitors and refine it into creative ideas of your own, but if I’m being honest, more than a few brands simply piggyback off the success of others in an unoriginal and often feeble attempt to ride their successes. Don’t let this be you. Once we’ve identified the story we want to tell, and we know how we’re going to use it (and across what channels), it’s time to get to work. From here, we should be crafting appealing content across multiple channels and using a mixed media approach that is designed to captivate, inspire, and evoke emotion around your brand. You have mere moments to capture attention, so no detail should be overlooked. Each word should have a place, a message of its own. Each color choice should be scrutinized. Every detail down to the choice of font, the spacing, and the placement of images needs to be carefully inspected to ensure that the message you’re trying to purvey is the one the customer receives. The process isn’t rocket science; it’s about the human element that brings each of us together. A company is nothing more than the story of the people who created it, what brought them to this point, and where they want to go in the future. Keep it simple, honest and make your point clear. Now, go out and tell your story.